Administration Site Help Documentation Adding a User: understanding the different types of error messagesRed Error messages when you add a new user? 3. The person already exists on another application but you cannot access them. Adding a new person and you get error messages and cannot press the save button? 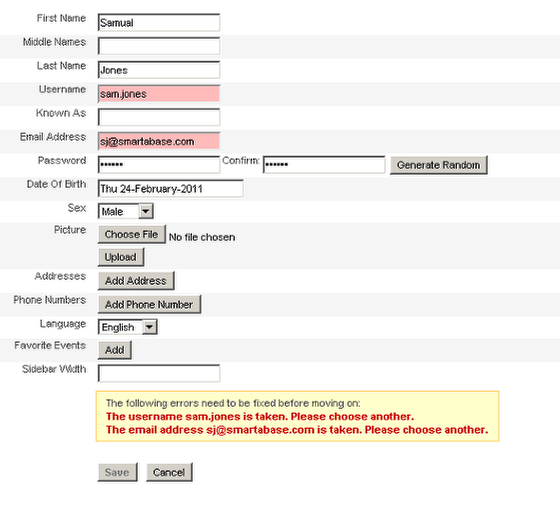 Each user must have a unique username and e-mail address. You cannot have 2 users on a system with the same username or e-mail address. For this example, double check that the person that you are trying to add is NOT already an existing user by searching for their details in the person search box (shown in the step below). The user was actually on the system already? Type the persons First name and see the matches which appear, then try their last name and see which matches appear. Remember that some users may be called by shortened first names or different spelling, so try different variations to ensure that the users is NOT already on the system. If they are NOT on the system try adding them again with a different username.